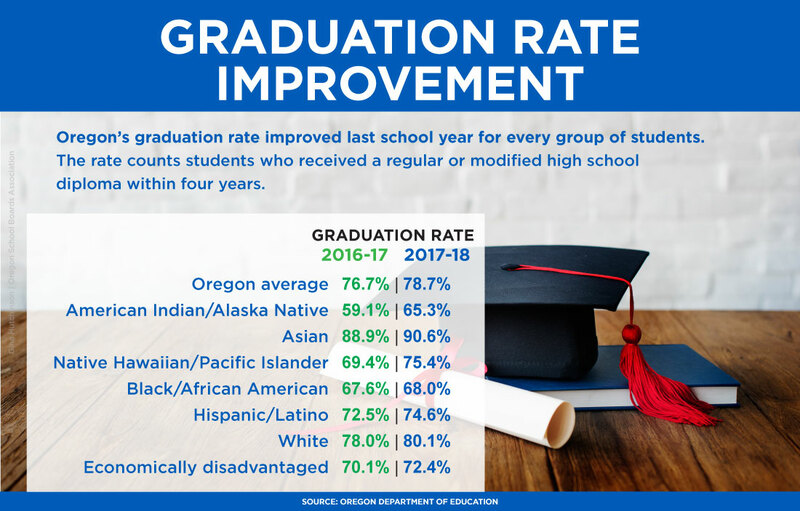 A 2 percentage-point increase for 2017-18 graduation rates continued Oregon’s steady improvement, but the 78.7 percent graduation rate remains far below what education advocates want for Oregon’s children. The Oregon Department of Education released graduation data Thursday, showing both how far Oregon has come and how far it needs to go. The Quality Education Model, a nonpartisan assessment of what Oregon requires for a high-quality education system, was created in 1999 with a target goal of 90 percent of students achieving Oregon’s academic performance requirements. The model recommends $10.7 billion for the 2019-21 State School Fund, a $2.5 billion increase from the previous biennium. Oregon has also set itself a goal of 100 percent of students earning a high school diploma or its equivalent by 2025. Oregon has long had one of the worst graduation rates in the country, ranking third worst among states in 2015-16 when the national average was 84 percent. Education professionals, legislators and community leaders agree underfunded classroom spending is at least part of the problem. The 2019 Legislature will be looking at bills to increase education spending as well as control costs and create accountability for school funding. During testimony Wednesday before the House Education Committee, Deputy Superintendent of Public Instruction Colt Gill credited the state’s focus on equitable education services for some of the graduation rate gains. Every subgroup of Oregon students showed improvement in the 2017-18 Oregon four-year cohort graduation rate report. American Indian/Alaska Native students made the biggest leap, improving more than 6 percentage points to 65.3 percent. Native Hawaiian/Pacific Islander, the only group to have a graduation-rate decrease the previous year, was also one of the biggest gainers, improving 6 percentage points to 75.4 percent. Most other groups improved about 2 percentage points, with migrant students (75 percent) and homeless students (54.1 percent) improving more than 3 percentage points. The achievement gap held roughly steady for most groups but widened for African American students, with the group’s graduation rating ticking up only 0.4 percentage points. The state’s overall 2 percentage point increase is part of a climb since 2013-14, when Oregon changed how it counts diplomas. The national graduation rate has also been steadily increasing, but some states have been accused of artificially inflating their rates through lower standards, easy credit-recovery programs or by moving students out of the system. OSBA Executive Director Jim Green applauded Oregon’s improvement in graduation rates but said OSBA would like to see the rates even higher. OSBA has committed to pressing the 2019 Legislature for adequate and stable funding for K-12 public education. The four-year cohort graduation rate tracks students who started high school in 2014-15. The graduation rate does not include students who earn GEDs or take more than four years to graduate. ODE takes a separate measure that includes other paths, called the completer rate. Green encouraged looking at the five-year completer rate as well, a measure of schools’ ability to help students who need extra support. For 2017-18, 84.6 percent of Oregon students earned a diploma or alternate certificate within five years, an improvement of 1.4 percentage points. Green pointed to the work of the Joint Committee on Student Success. The bipartisan legislative panel toured schools around the state last year, and members repeatedly said they were especially struck by the need for more counseling and mental health services in schools. The ODE news release announcing the graduation rates noted that Gov. Kate Brown’s November budget proposal would increase education funding, with some dedicated to programs targeted at improving graduation rates. Brown also proposed more money for career and technical education, which has been linked with improved graduation rates. Students who earned a half credit in a CTE class graduated at an 88.1 percent rate and students who earned a CTE credit or more graduated at a 92.8 percent rate, according to the report. This is your opportunity to rally around the issue that our members have told us is their main concern: revenue reform to ensure stable, adequate and equitable funding for our schools. The biennial Quality Education Model is the gold standard of Oregon public education goals, but the Legislature has never met its funding targets. Education funding in Oregon is about 9 percent below the national average.